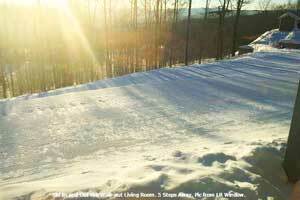 Find your own ski in and out by owner rental in Killington-click on this link! Trail Creek 1 Bedroom Loft Fireplace Renovated Ski Home Walk to Lifts or Shuttle - 2 bedroom 1 bath, sleeps 5, from $157/nt-- Book it! great area for ski stuff and boot removal as you walk in. VERY close to amenity building and ski home trail. all new bedding, pillows, blankets and mattresses. 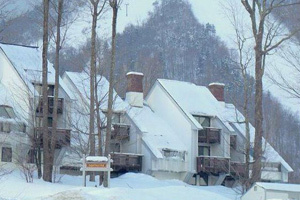 Great 2 Bedroom 2 Bath Penthouse Condo at Killington - 2 bedroom 2 bath, sleeps 6, from $325/nt-- Book it! Trip Advisor # FKN2673216 - Our condo is located at Mt. Green Ski & Golf Resort right at the base of Killington. You can walk to the lifts or take the shuttle which stops at our ski locker and takes about 2 minutes to get down to the lifts. The condo sleeps 6 and has the best ever memory foam mattresses. You don't have to go outside to get to the indoor pool, health club, sauna, jacuzzis, eucalyptus steam room, restaurant, deli, racquet ball, ski shop or gift shop because they are located right in our building. If you like to get up in the morning and look out the window at the beautiful slopes, this condo is for you. Skylights provide an open feel, but the condo is cozy enough to feel like home. There is ample closet space for your gear. Our condo is Mt. Green Unit 3G3. Trail Creek Pool/Sauna/Jacuzzi King, Queen 2 Full Baths Renovated Two Level Unit - 2 bedroom 2 bath, sleeps 6, from $172/nt-- Book it! VRBO 446305 -This unit had a major renovation 11/25/12 New kitchen appliances, new counter top, one bathroom completely redone with granite, class shower door, custom tile work, new lighting, and new flooring. New mattresses new king bed furniture, new TV's flat screen with smart TV in the living room. new carpet upstairs, hotel collection linens, down pillows and down comforters, new kitchen supplies and dishes. A great property!! Ski home, Bus to lifts. 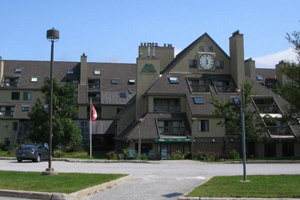 Ski in and Ski Out Slopeside Condo - 2 bedroom - 2 bath - sleeps 6 - from $370/nt -- Book it! Trip Advisor Listing # FKN9287455 -Our updated and contemporary Killington trailside condo is perfect for a family or couples getaway! Featuring 2 en-suite bedrooms with full private baths, living room with fireplace & queen sleeper, remodeled & fully appointed kitchen, high speed WIFI internet, dining area, laundry and balcony with views, you'll find ideal accommodations for a relaxing or adventurous retreat to the Green Mountains! Located in the Sunrise Mountain Village, Killington's only true ski on ski off community, you'll enjoy an abundance of resort amenities and activities. Ski out the back of the condo to the easy green Sundog trail and down to the Sunrise triple chair (free access - no lift ticket required! ), then up to Bear Mountain and access to Killington's six peaks. Ski home at lunch or the end of the day for a unique on-mountain experience, no vehicles, parking lots and hassle! Visit the commons for indoor & outdoor pools, hot tub, steam room, gym or swing by Sunrise Cafe for lunch or dinner. Luxury Renovated Trail Creek 3bed/3bath 2 king &3 twin Beds Sauna, Jacuzzi - 3 bedroom - 2 1/2bath - sleeps 8 - from $373/nt -- Book it! VRBO 326062 - This is an end unit with no one above or below you. It is important not to rent a unit with anyone above you especially in ski season due to noise. Totally Renovated: 3 bedroom 3 bathroom, there is an additional bathroom with a sauna LARGE Jacuzzi, and shower. Large entry: has a bench, coat rack, area for skis and boots. Washer and dryer off the entry. Bedrooms: Master is downstairs with a king bed and private bath.Both king bedroom have new memory foam mattresses. Master bedroom has a ceiling fan. Two bedrooms upstairs one has a king bed the other has two twin beds and a twin loft type bed. King bedroom downstairs/upstairs have a memory foam mattress that will be new in June along with the new king bed furniture, coverlets,down comforters, luxury duvets, and luxury pillows. Blackout drapes are in the master and king bedrooms. All bedrooms have flat screen TV’s and DVD players. Some have VHS players all rooms have cable. Wood burning fireplace with wood provided. New glass tile hearth absolutely stunning unit. Baths: 2 custom Mosaic tiled showers, mater has an oversize shower with Speakman shower head tiled floors and granite tops in the sink area. The Upstairs shower has a rainbath showerhead, marble flooring and marble sink area. 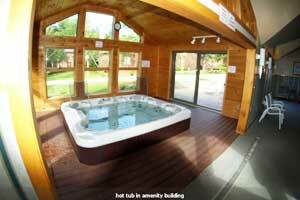 The Jacuzzi, sauna and shower bath has wood flooring. The sauna holds people comfortably. - 3 bedrooms - 2.5 baths - sleeps 14 - from $775/nt- Book it! VRBO 668243 - Fabulous Solitude Location! This spectacular upgraded three bedroom condominium has a slopeside view of all the action on the ski trails and the Solitude high speed quad. The sunrise view overlooking the mountain is the perfect way to start your morning. This fully decorated and includes electronic upgrades that include built in 60 inch TV, 42" TV in the bedrooms, Sonos Sound System and Xbox gaming system. This great location also walking distance to the Solitude Village amenities, such as the Best Restaurant on the mountain EPIC, indoor-outdoor pool, sauna, jacuzzi and fitness room. After the mountain closes, the location is perfect for sledding, hiking or dog walking around the trails. 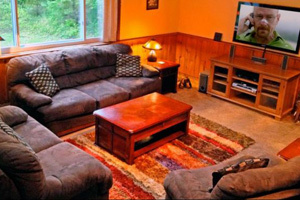 A Large, Cozy Ski House Minutes from Okemo and Killington -6 bedrooms - 2 baths - sleeps 16 - from $327/nt- Book it! 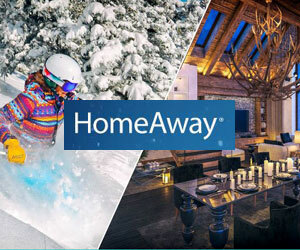 Homeaway 204876 - This house has it all – a glorious outdoor hot tub to sink into after a hard day skiing nearby Okemo or Killington. Six bedrooms. Two kitchens, two living rooms and two dining rooms. Plenty of room for your group of up to 16! The house is just 3 miles from Okemo’s Jackson Gore area and 12 miles from Killington’s Skyeship! Lake Rescue Chalet sleeps 16 people on two levels that each feature full living areas – including a kitchen/living/dining room – and three bedrooms apiece! Upstairs and down are connected by a wrought-iron spiral staircase, and each level has its own bathroom, fireplace, TV and VCR. It's a terrific home for families and friends who want to spend time together but also cherish their privacy. When not skiing, families and groups enjoy our many videos and games. 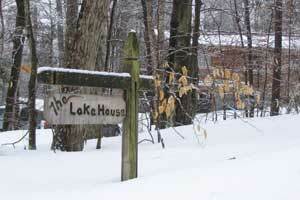 The snow is thick and the winters are cold -- perfect for skiing! With nine ski areas within 40 miles, you have plenty to choose from. In other seasons the mountains are the greenest of green and a string of pristine lakes is the bluest of blue. The fish are always biting in the summer; feathery flakes fall on red-gold leaves in October; and flowers burst into a jumble of audacious color in May. The only thing that beats taking a canoe out on a misty summer morning is screaming down a ski slope after a fresh snowfall. calendar - map - reviews! 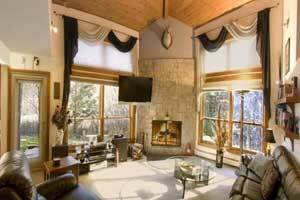 The Killington Mountain Retreat - 7 bedrooms - 3 baths - sleeps 24 - from $251/nt- Book it! Trip Advisor # FKN3275892 -The Killington Mountain Retreat is a vacation home located just off the main access road in Killington, Vermont. This three-floor, 7 bedroom home is fully equipped and furnished. In addition to the bedrooms, there is a large kitchen, living room, game room, media room, mud room and large outdoor deck with hot tub, outdoor speakers, propane BBQ grill and outdoor dining table and chairs. The living room and media room feature flat screen TVs, DVD players, stereo systems, Apple TV with Netflix and AirPlay, Nintendo Wii, cable TV and high speed wireless Internet access.It's located on 1.1 acres and is the perfect all season escape. In the summer, you can BBQ on the deck, play on the lawn or head to the town pool and recreation center. We also have two golf courses, mountain biking, hiking, lakes, swimming,, shopping, antiquing and much more within a short drive. In the fall, you get to experience the magnificent colors of a Vermont fall. In the winter, of course you get the best skiing and riding on the east coast.Bedding by bedroom:- 1A: twin over full bunk bed (sleeps 2-3)- 1B: twin over full bunk bed (sleeps 2-3)- 2A: twin bed, (2) twin bunk beds (sleeps 5)- 2B: twin over full bunk bed (sleeps 2-3)- 3A: twin bed, (2) twin bunk beds (sleeps 5)- 3B: twin bed, (2) twin bunk beds (sleeps 5)- 3C: full bed, twin bunk bed (sleeps 3-4). Killington, Vermont By Owner Rentals - Our Blog!